Just a couple of weeks ago, my laundry was a wall of ad-hoc cabinetry along one wall in my garage (see it here). It was by far my most disliked area of our home and I decided to finally do something about it. Like with all bigger redecorating or renovation jobs, I started by creating a mood board of the look and feel I wanted to create. I find it such a helpful way to gather inspiration and curate ideas. Then it was on to construction. I had a carpenter build a wall to divide our garage into two sections — a laundry/mudroom (pictured below) and a garage for our cars. You can see in this pic that the new wall on the right has been completed and the plasterer has also come and gone. Now I just need to prep and paint the wall and get a door handle put on the new internal door. 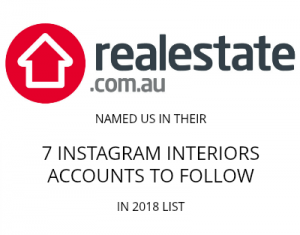 I found the most amazing joiner/cabinet maker EVERRRRR (Matthew from MCV Constructions for anyone in the Canberra region) who fixed up the cabinetry in here. 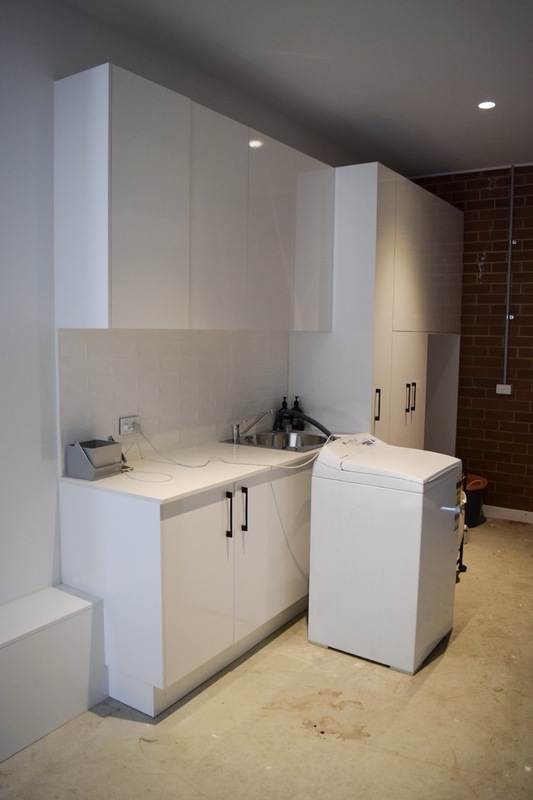 He removed the end cupboards, cut them down to size, and built a new overhead cupboard and sleeve to fit the new washing machine into at the end of the room. He also built a small bench seat to connect the joinery to the door leading into the dining space. I’ll be receiving my new LG Twin Wash machine this week and I can’t wait to see it in place. Our lovely tiler Scott of Kennedy Tiling and Bathroom Renovations has also been and gone, laying beautiful soft grey 600×600 floor tiles. He did such a fab job and I’m saving the photos of that until the final reveal! Now all that’s left to do is painting, painting, painting. 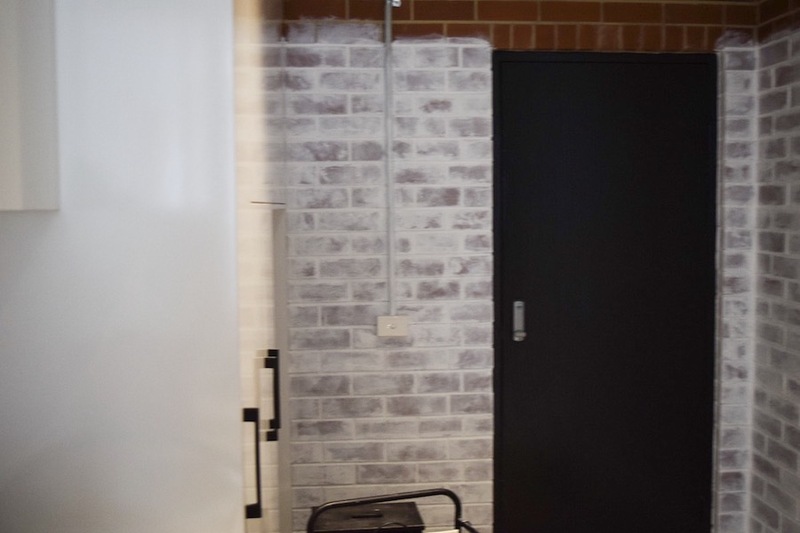 I had an idea to do an industrial style white wash effect on the brick wall (pictured below) but have since had a change of heart. 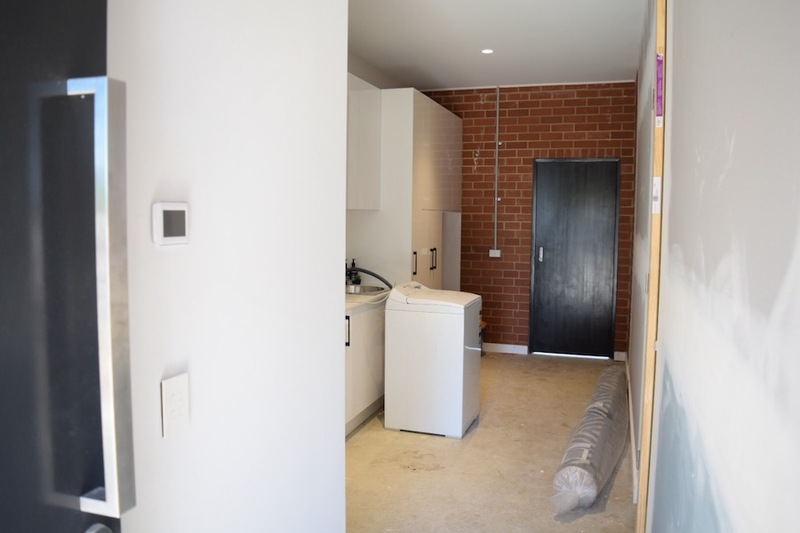 Everything in this space is very contemporary and clean, and the wash effect brick just felt too busy so I’ll be painting the bricks solid white instead. And then of course, I’ll need to do the fun part of styling and putting on all the finishing touches. Can’t wait to see the end result, suspect solid white better idea than white-wash style. Thanks Caroline, I did the first solid coat of white on the brick this weekend and it looks way better. Finished pics coming very soon, yay!